The 7th annual “Senior Citizen Day at Park” will be held at clubhouse at Mount Hood Memorial Park & Golf Course on Tuesday, May 7th from 11:00 am to 2:00 pm. Come join us at beautiful Mount Hood and enjoy the day inside the rustic setting of the recently renovated clubhouse. There is no charge for this event! This year promises to be another exciting event as we have Kevin Curtis from the Saugus Iron Works who will present information on resources available for seniors as well as well as what’s new at the Iron Works. Also, we will have someone from the Conservation Commission speaking about green spaces in Melrose. Lunch and refreshments will be served following the presentations after which time attendees will travel up to the 4-story Slayton Tower, the highest point in the park, to experience the panoramic view of the area including the mountains of New Hampshire, Revere Beach, and the Boston skyline. To reserve a seat for this event, please call 781-665-8172. For seniors who require transportation to/from Mount Hood clubhouse, please call 781-665-4304 between the hours of 8:00 a.m. and noon. There is a maximum seating of 100 people for this event so please call early to reserve a seat. RESERVATIONS FOR THIS EVENT MUST BE RECEIVED BEFORE MAY 3rd! This event is being sponsored by the Mount Hood Park Association in association with Melrose Park & Recreation Departments, Melrose Council on Aging, and Golf Management Company. On Sunday, December 2nd, the Mt. 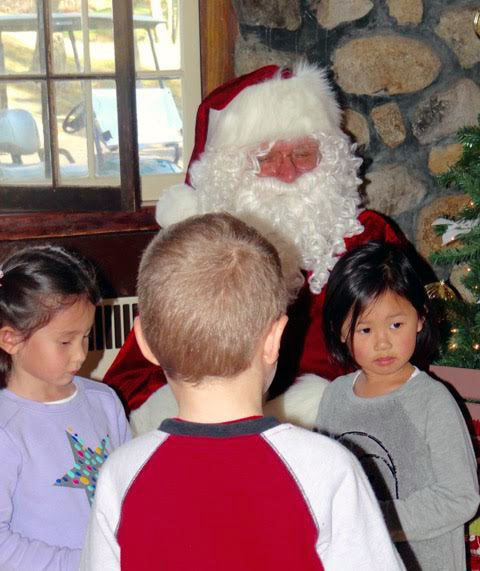 Hood Park Association held its annual free Children’s Holiday Party at the Mount Hood clubhouse in the rustic setting of Mount Hood Memorial Park and Golf Course. 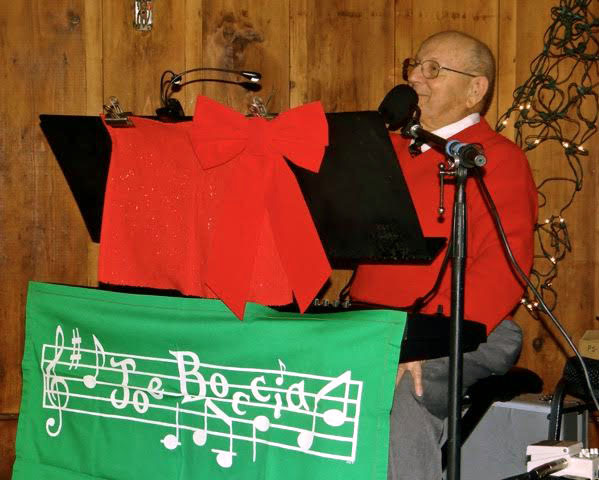 In the festively decorated clubhouse, a large turnout of adults and children enjoyed live musical entertainment by Joe Boccia and sing-alongs, the Balloon Magic of Yarrow, face-painting by Jackie, as well as a visit from Santa Claus. Refreshments were provided by the Association while donuts were donated by Dell and Danny at Dunkin Donuts, 1204 Broadway, Saugus, MA. Special thanks are also extended to Joan Bell from the Park Department, Golf Management Co, LLC for the use of the hall and decorations and their Food and Beverage Manager, Hillary Loge. As part of the Home for the Holidays Celebration in Melrose, the Mt. Hood Park Association invites the public to attend their annual and festive “Children’s Holiday Party” at the Mount Hood Clubhouse, 100 Slayton Road, Melrose on Sunday, December 2nd from 1:00 - 3:00pm. Please join us for this popular and festive event which includes live musical entertainment, a visit by Santa Claus, and children sing-alongs! Desserts and refreshments will be served. This year we have invited back the Balloon Magic of Yarrow, who will entertain children with his amazing balloon magic - twisting them into various shapes with embedded LED lights and given to children in attendance. Also, we have a new event we are adding this year – face painting for the kids! All children must be accompanied by a parent or guardian. For more information, call (781) 665-8172. In one of the most beautiful venues in Melrose, the largest audience to date attended the Association’s 33rd annual July 4th Concert at Mount Hood featuring music with a patriotic theme. This program was supported in part by a grant from the Melrose Arts Council. The Middlesex Concert Band of Wakefield, under the direction of Mark E. Olsen, provided spirited arrangements of many patriotic and show tunes to the enthusiastic approval of the audience. This was a remarkable performance by the band given that they had played at a previous venue earlier in the day in temperatures exceeding 90 degrees! There was a special tribute to the Elvis Presley playing many of his songs that made him so famous. The festivities began with introductory remarks by Association president, Myron F. Dittmer, Jr. and later with remarks by our State Representative Paul Brodeur. The final and most exciting song of the evening included the band’s rendition of” Stars and Stripes” which included our popular “Parade of Children” who waved their American flags while parading around the venue. The Association would like to extend our special appreciation to the following companies and organizations that helped make this event such an impressive success this year. They include, Melrose Park Commission, Melrose Park Department, the Melrose Recreation Department, Golf Management Company, LLC (who provided free popcorn and juice for the children), Hillside Printing, LLC, Inc. (who provided the programs), and of course, the Middlesex Concert Band for their extraordinary music presentation. Our next Association event is the July 4th concert in front of the clubhouse at Mount Hood featuring the Middlesex Concert Band - festivities begin at 6:45 pm and ends at sunset. This family event features patriotic theme music as well as show tunes - with free flags given to all children in attendance including popcorn and juice - so bring your blankets and lawn chairs and enjoy the music in the beautiful rustic setting of Mount Hood Memorial Park! The 6th annual “Senior Citizen Day at the Park” event was held on Tuesday May 8th at the clubhouse at Mount Hood from 11:00 a.m. to 2:00 pm. This senior citizen-only event was sponsored by the Mt. Hood Park Association. 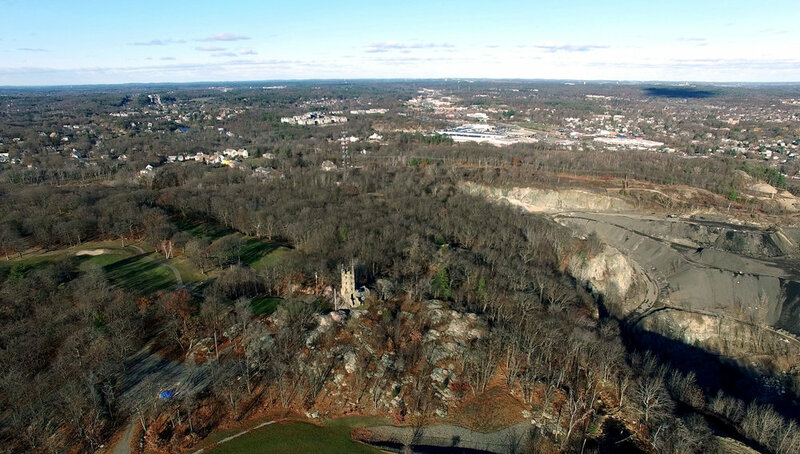 This year’s event was attended by over 100 seniors who were treated to several lectures, a luncheon, and ended with a sightseeing trip to Slayton Tower for a panoramic view of the surrounding countryside and the Boston skyline. In attendance were Mayor Gail Infurna, Ward 6 Alderman, Peter Mortimer, and State Representative, Paul Brodeur who welcomed all seniors to this special event. The featured speaker of this event was Lynn Woods Ranger, Dan Small, whose presentation was on the history and the development of Lynn Woods as a recreational area as well as its flora and fauna. Dan noted that legends of pirates and their buried treasures are part of the history of Dudgeon Rock and Pirate’s Glen. His talk also included a brief description of programs available for runners, bikers, hikers, birders, and children. There are many events sponsored throughout the year at Lynn Woods and you can learn more at their web site - Lynnwoods.org. After lunch, the next speaker was Myron Dittmer, President of the Mt. Hood Park Association, who spoke on the history and development of the park and the golf course in the 1930’s, its flora and fauna as well as winter and summer activities held at the park over the years. After his talk, everyone was invited up to Slayton Memorial Tower inside the park to enjoy the scenic view from the top of the 4-story tower. We are now taking reservations to attend the Association's Senior Day at the Park" event as described below. To reserve a seat, please call (781) 665-8172. If you need transportation to this event, kindly call (781) 665-4304, after May 1st between 8 am and 12 noon. There is no charge for this event. This event has limited seating so please call soon to reserve a seat. The 6th annual “Senior Citizen Day at Park” will be held at clubhouse at Mount Hood Memorial Park & Golf Course on Tuesday, May 8th from 11:00 am to 2:00 pm. Come join us at beautiful Mount Hood and enjoy the day inside the rustic setting of the recently renovated clubhouse. There is no charge for this event! This year’s event promises to be another exciting event as we have Ranger Dan Small, of Lynn Woods, who will present information on hiking as well as an overview of trails available at Lynn Woods. Also, Association president, Myron Dittmer, will again provide a brief history on development of Mount Hood Memorial Park and Golf Course beginning in the 1930’s. Lunch and refreshments will be served following the presentations after which time attendees will travel up to the 4-story stone tower, Slayton Tower, the highest point in the park, to experience the panoramic view of the area including the mountains of New Hampshire, Revere Beach, and the Boston skyline. 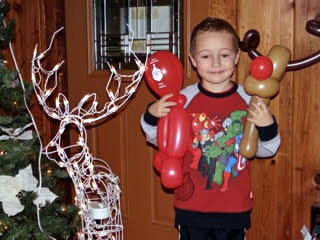 The Association’s “Children’s Holiday Party” was held on Sunday, December 3rd and was well-attended with a packed clubhouse at Mount Hood. 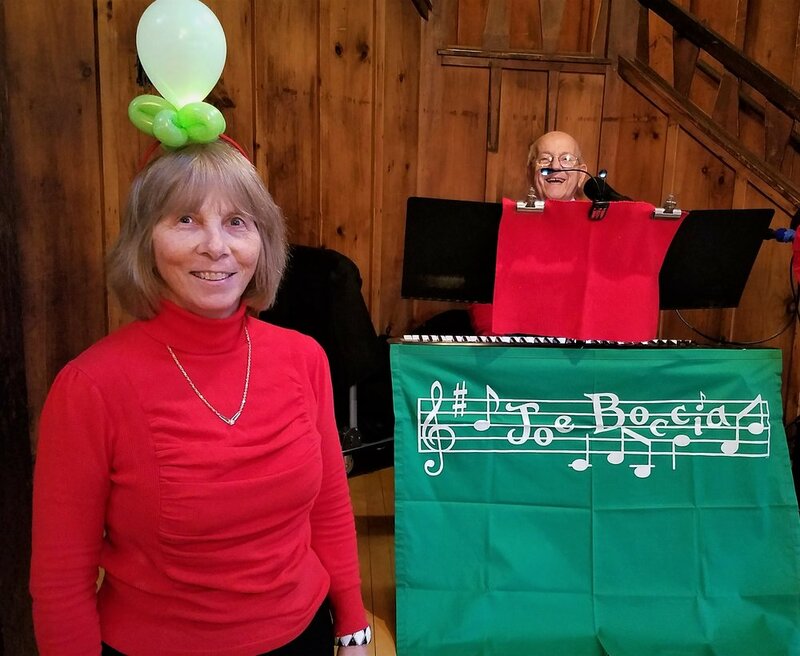 Children and adults alike enjoyed the lively music of Joe Boccia on keyboard, sing-alongs, Yarrow- the balloon magician, as well as nice gifts won by children in a free raffle. Later, Santa Claus arrived to listen to children requests for Christmas gifts – while Santa handed out free candy canes and small American flags. In all – it was a great way to kick-off the holiday season in the beautiful setting of our green jewel - Mount Hood! As part of the Home for the Holidays Celebration in Melrose, the Mt. Hood Park Association invites the public to attend their annual and festive “Children’s Holiday Party” at the Mount Hood Clubhouse, 100 Slayton Road, Melrose on Sunday, December 3rd from 1:00 - 3:00pm. Please join us for this popular and festive event which includes live musical entertainment, a visit by Santa Claus, and children sing-alongs! Desserts and refreshments will be served. This year we have invited back the Balloon Magic of Yarrow, who will entertain children with his amazing balloon magic - twisting them into various shapes and given to children in attendance. Also,we will again have a free children's raffle with great prizes! I am happy to report that the Park Department is installing a new bench and picnic table up at Slayton Tower. After years of discussion between the Association and the Park Department, an emphasis is being placed in improving public accommodations at Slayton Tower. For those people and families who frequent the park and take the time to hike up to Slayton Tower, finding suitable areas to sit and rest has always been an issue. It's encouraging to finally see these improvements being made at the Tower - but we need more than one picnic table and bench in this area. We hope that this is only the beginning of installing more of these vandal-proof accommodations throughout the park for use by seniors and families. The Association's 32nd Annual July 4th Concert was held on Tuesday under clear skies - and was well-attended with adults and children enjoying show tunes and patriotic theme music provided by the Middlesex Concert Band under the direction of Mark E. Olsen - all children were provided with free popcorn and lemonade and later were given American flags while they marched around the venue during the playing of the last song - "Stars & Stripes". We would like to acknowledge the support and help from the following city departments and organizations: Melrose Park Department, Park Commission, and Recreation Department, as well as Golf Management Company and Hillside Press, LLC who donated the programs. This concert was supported in part by a grant from the Melrose Messina Fund for the Arts. Our next free event is the July 4th concert held in front of the Mount Hood Clubhouse scheduled for Tuesday, July 4th, beginning at 6:45 pm to sunset. Bring the family along with blankets and lawn chairs and enjoy the rustic setting of Mount Hood for an evening of show tunes and patriotic theme music played by the Middlesex Concert Band. The Association had a great turnout for its free May 9th event at the Mount Hood clubhouse where seniors were treated to several lectures, enjoyed a great buffet lunch, and drove up to Slayton Tower to beautiful scenic views of the Boston skyline, Revere Beach, and the southern mountains of New Hampshire. We had a capacity crowd of 100 attendees, with a long waiting list, listened to local co-author Douglas Heath discuss the book entitled, “Breakheart Reservation Through the Centuries”. His enlightening talk centered around the history of Breakheart Reservation beginning with its ownership by wealthy families, who enjoyed its rustic setting for their family outings, family murder mysteries, and then later the donation of the 640 acres to the state for reservation use only. Douglas and his wife, Alison will have another of their books published in June entitled, “Lost Mills Village of Middlesex Fells” – the story of Haywardville Mills around Spot Pond in the 1600’s. Later, Myron Dittmer, Association President, spoke on the historical development of Mount Hood Golf Course and Park in the 1930’s including historic events and happenings at Mount Hood over the past 90 years. Also, included in his presentation was a description of flora and fauna present at Mount Hood. At the conclusion of his lecture, attendees drove up to Slayton Tower for sightseeing. "Senior Citizen Day at the Park": This event is filling up rapidly with limited seats available - we expect a full house - so if interested in attending, please call soon. The next Association event is our 5th annual “Senior Citizen Day” at Mount Hood Park to be held at the clubhouse at Mount Hood Memorial Park & Golf Course on Tuesday, May 9th from 11:00 am to 2:00 pm. Come join us at beautiful Mount Hood and enjoy the day inside the rustic setting of the recently renovated clubhouse. There is no charge for this event! This year’s event promises to be another exciting event as we have well-known local authors Alison C. Simcox and Douglas L. Heath who will present a talk on “Breakheart through the Centuries” based on their book “Breakheart Reservation” which traces the history of Breakheart Reservation from its natural origins, through colonial settlements, to a public park of extraordinary beauty. Also Association president, Myron Dittmer, will speak on the history and development of the park and golf course beginning in the 1930’s with new photos discovered as well as winter and summer activities held at the park over the years. Lunch and refreshments will be served following the lectures after which time attendees will travel up to the 4-story stone tower, Slayton Tower, the highest point in the park, to experience the panoramic view of the area including the mountains of New Hampshire, Revere Beach, and the Boston skyline. Please stay tuned for further details on registering for this event and for assistance if transportation is needed. This event is being sponsored by the Mount Hood Park Association, Melrose Park & Recreation Departments, Melrose Council on Aging, and Golf Management Company at Mount Hood. Mt. Hood Park Association is dedicated to the preservation, protection, and promotion of Mount Hood – please visit our newly renovated website at www.mthoodpa.com. Used my son' s drone to take some unique pictures around Slayton Tower recently. On Sunday, December 4th, the Mt. 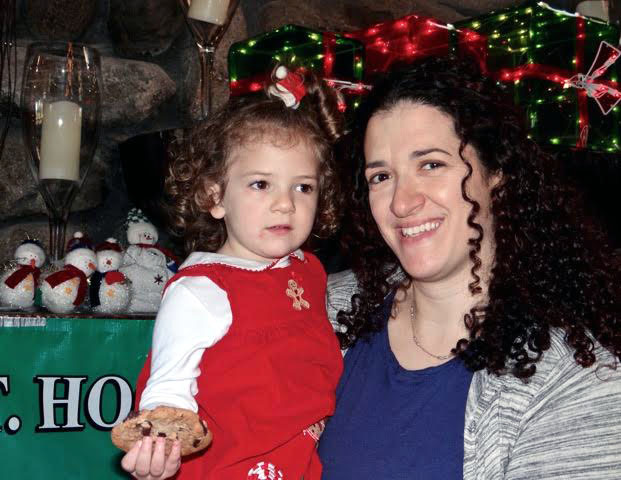 Hood Park Association held its annual free Children’s Holiday Party at the Mount Hood clubhouse in the rustic setting of Mount Hood Memorial Park and Golf Course. 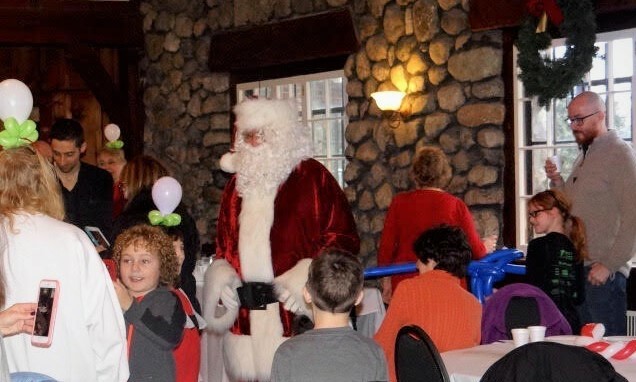 In the festively decorated clubhouse, a large turnout of adults and children enjoyed live musical entertainment, sing-alongs, the balloon magic of Yarrow, a free children’s raffle, as well as a visit from Santa Claus. Refreshments were provided by the Association while donuts were donated by Dell and Danny at Dunkin Donuts, 1204 Broadway, Saugus, MA. Special thanks are also extended to Golf Management Co, LLC for the use of the hall and decorations and their Food and Beverage Manager, Laura Farrell. Also, the Association would like to thanks the following people and companies for raffle prizes: Debbie Collar, Boston Red Sox, Boston Children’s Museum, and many others for their generous donations. As part of the Home for the Holidays Celebration in Melrose, the Mt. Hood Park Association invites the public to attend their annual and festive “Children’s Holiday Party” at the Mount Hood Clubhouse, 100 Slayton Road, Melrose on Sunday, December 4th from 1:00 - 3:00pm. Please join us for this popular and festive event which includes live musical entertainment, a visit by Santa Claus, and children sing-alongs! Refreshments will be served. This year we have invited back the Balloon Magic of Yarrow, who will entertain children with his amazing balloon magic - twisting them into various shapes and given to children in attendance. This year we have again added a free children’s raffle with an opportunity for them to win exciting holiday prizes. Each child will receive several raffle tickets upon attending this event and they can put it towards a chance to win a prize of their choice. Mass Golf Management Company, which runs and operates Mount Hood Park & Golf Course, will host an event open to the pubic on Monday, September 19, at 7:00 PM at the clubhouse. This event, which welcomes both golf cub members and neighbors, is being held to receive opinions and concerns from the public on the running of the golf course and park. This is a great opportunity to have your opinions and concerns brought before those who are running this wonderful golf course and park. Look forward to seeing you. The next Association event is our Children's Holiday Party, scheduled for Sunday, December 4th, from 1 to 3 PM. There will be live musical entertainment, sing-alongs, the balloon magic of Yarrow, free deserts and refreshments as well as a visit from Santa Claus. Come join us for fun and entertainment in the Mount Hood Clubhouse located at beautiful Mount Hood Park. We occasionally ask our visitors to provide feedback on issues involving Mount Hood. If you have any recommendations or comments to make concerning your experience at Mount Hood Park & Gold Course or wish to suggest some improvements please do not hesitate to contact us. 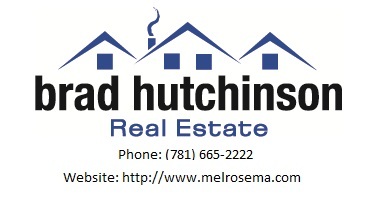 Use the contact information provided in the CONTACT section of our website. We had great weather for our July 4th concert at Mount Hood Monday evening. Several hundred people and children enjoyed the music of the Middlesex Concert Band consisting of patriotic music as well as show tunes. Association President, Myron Dittmer, welcomed guests and introduced Ward 6 Alderman Peter Mortimer who sent Happy July 4th wishes from Mayor Dolan. Cariisa Scudieri began the concert with her beautiful rendition of our National Anthem followed by Conductor Mark E. Olsen who then began the concert. Stars and Stripes was the last song played while children were given free flags and paraded around the venue marching to the beat of the music! This was a wonderful way to end the concert with marching children waving their flags to the loud applause from the audience. Please join us again next year for our "Music in the Park" event on July 4th 2017! Until then - stay healthy and be safe! Don't forget to attend our free concert this evening at 6:45pm - bring your blankets and lawn chairs as well as the children to enjoy an open-air concert in rustic Mount Hood! Free flags for all children in attendance as well as popcorn and drinks. Good weather is expected! Our nest Association event is the July 4th Concert at Mount Hood. The Mt. Hood Park Association is sponsoring its 31st Annual July 4th Concert in front of the clubhouse at Mount Hood Memorial Park, 100 Slayton Road, Melrose. Festivities will begin Monday, July 4th, at 6:45 pm with the Middlesex Concert Band providing music. This year’s music program promises to be an exciting selection of new songs highlighting the patriotic theme of the day as well as popular show tunes. Free popcorn and lemonade for the children will be provided compliments of Golf Management Co as quantities last. 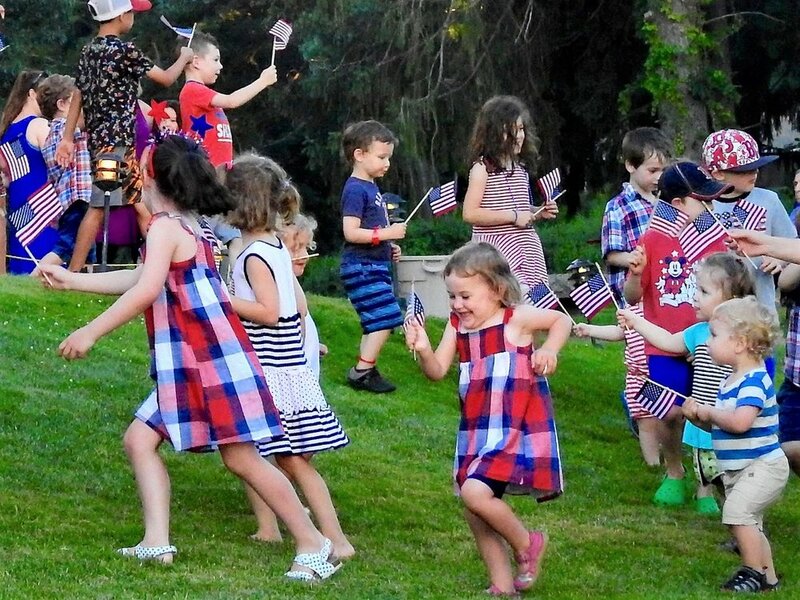 We are continuing the tradition of ending the concert with “Stars and Stripes Forever”, in which all children will be given free American flags to wave while marching in front of the clubhouse. Come join us for a special July 4th celebration and bring your family and blankets or chairs to listen to music in one of the most beautiful and pristine venues in Melrose. What a great sunny day it was for our 4th annual "Senior Citizen Day at the Park" event at the Mount Hood Clubhouse yesterday! We had a capacity crowd of seniors who were entertained by lectures followed by lunch and then a trip to Slayton Tower for a perfect day for sightseeing. Lindsay Beal, Board Vice Chair of the Friends of the Fells Reservation, presented helpful hints and information to seniors on preparations for hiking in the woods - listing the types of equipment, food, supplies and other necessities. She also provided information on precuations to take to prevent exposure to poison ivy and ticks. Later, Louise Fennel, from the Melrose Mirror, briefly spoke, about their electronic magazine which is published monthly on personal stories about community life and experiences. Most of the stories are centered around life and history of Melrose including special topics of interest to the authors. Myron Dittmer, president of the Mt. Hood Park Association, spoke about the historical development of Mount Hood Memorial Park & Golf Course showing pictures from the 1930's of the construction and development of the park over the past 85 years including activities and special events. Attendees at Senior Citizen Day at the Park event at the clubhouse at Mount Hood in Melrose. Lindsay Beal from the Friends of the Fells Reservation speaking to the attendees. Louise Fennell from the Melrose Mirror discussing their monthly electronic magazine. Joe and Patricia Doucett being introduced by Association president Myron Dittmer, noting that they were married at the clubhouse 61 years ago. Association president Myron Dittmer with Helen Giorgio whose husband, Charlie, was one of the original founding members of the Mt. Hood Park Association back in 1971. Attendees at Senior Citizen Day at the Park. The 4th annual Senior Citizen Day at Mount Hood Park will be held at clubhouse at Mount Hood Memorial Park & Golf Course on Tuesday, May 10th from 11:00 am to 2:00 pm. Come join us at beautiful Mount Hood and enjoy the day inside the rustic setting of the recently renovated clubhouse. There is no charge for this event! This year’s event promises to be another exciting event as an experienced guide from the Friends of the Fells will discuss hiking in the woods and what to wear while hiking. Also Association president, Myron Dittmer, will speak on the history and development of the park and golf course beginning in the 1930’s as well as winter and summer activities held at the park over the years. To reserve a seat for this event, please call 781-665-8172. If you require transportation, kindly call 781-662-6886 on weekdays between noon and 4:00pm. RESERVATIONS FOR THIS EVENT MUST BE RECEIVED BEFORE MAY 6th! Went hiking at Mount Hood this morning - great day for this activity. With no golfing, it was quiet with few people in the park. A bird feeder near 3rd Pond with a Black-Capped Chickadee as a visitor. Snow is nearly gone at Mount Hood - a sure sign that spring is coming! This is a perfect time for a walk or hike on the trails at Mount Hood. Use the trail maps available at this website to enjoy the rustic setting of Mount Hood park. The City's Winter Festival at Mount Hood, near the clubhouse, is scheduled for Thursday, Feb 18th, from Noon to 2:30 pm. This is always a popular and well-attended event - and with the snow and cold weather - it will be prefect conditions for all winter sports and festivities planned. Lots of activities are planned so don't miss this event! It is recommended that you park at Incarnation Church on Upham street, since there will be limited parking available at Mount Hood. A shuttle service will take you from the church to the park. Recent winter scenes at Mount Hood. It is now snowing in Melrose and it s worth a trip up to Mount Hood to enjoy the winter scenes of the park & golf course. Snow shoeing and cross-country skiing is allowed while there is snow on the course. We now have a Facebook page so please join us and "like us" at mounthoodpark. Also feel free to interact with us on any issues involving Mount Hood Memorial Park & Golf Course. The next Association event is the "Senior Citizen Day at the Park" event scheduled for Tuesday, May 10th, at the clubhouse, from 11:00 am to 2:00 pm. The event will include several lectures on hiking by members of the Friend of the Fells. A free lunch will be provided along with sightseeing at Slayton Tower, the highest point in the park with panoramic views of the Boston skyline, Revere Beach and the White Mountains of New Hampshire. More information on this event will be posted later including how to sign up to reserve a seat for this event as well as how to get a ride to and from the event if needed. 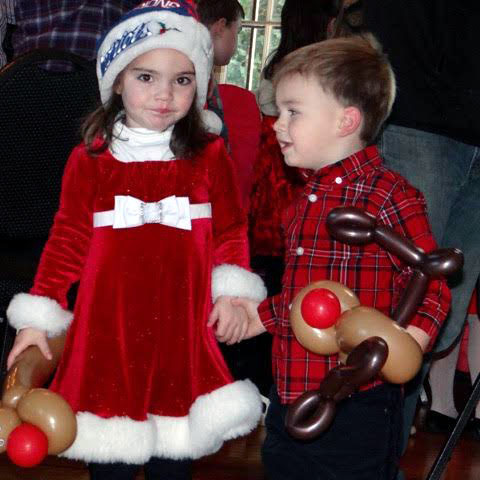 The Association's Children's Holiday Party was well-attended on Sunday, December 6th. 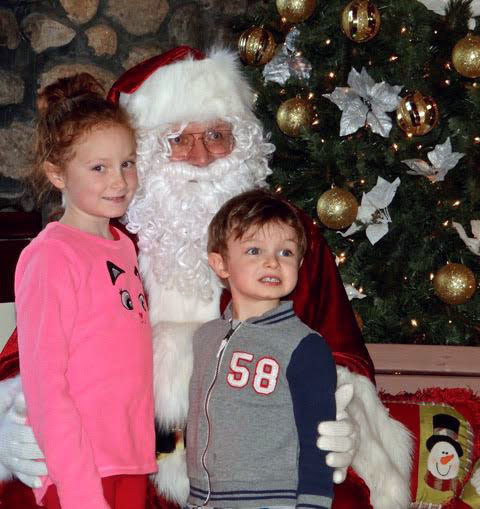 In the festively decorated clubhouse, a large turnout of adults and children enjoyed live musical entertainment, sing-alongs, the balloon magic of Yarrow, a free children’s raffle, as well as a visit from Santa Claus. Refreshments were provided by the Association while donuts were donated by Dell and Danny at Dunkin Donuts, 1204 Broadway, Saugus, MA. Special thanks are also extended to Golf Management Co, LLC for the use of the hall and decorations and their Food and Beverage Manager, Laura Farrell. Also, the Association would like to thanks the following people and companies for raffle prizes: Debbie Collar, Prince Pizzeria, Boston Red Sox, Stoneham Zoo, Hunt’s Photo & Video, and Diane Louise Paul. Also, special thanks to Association members, Debbi Collar for organizing the raffle and acquiring all those great raffle prizes - and Paul McQuillan and Chris Walsh. As part of the Home for the Holidays Celebration in Melrose, the Mt. Hood Park Association invites the public to attend their annual and festive “Children’s Holiday Party” at the Mount Hood Clubhouse, 100 Slayton Road, Melrose on Sunday, December 7th from 1:00 - 3:00 pm. Please join us for this popular and festive event which includes live musical entertainment, a visit by Santa Claus, and children sing-alongs! Refreshments will be served. This year we have invited back the Balloon Magic of Yarrow, who will entertain children with his amazing balloon magic twisting them into various shapes and given to children in attendance. Also, this year we are having a free raffle for the children. Each child will be given a ticket with an opportunity to win an exciting prize. All children must be accompanied by a parent or guardian. For more information, contact Myron Dittmer at (781) 665-8172. The Association is having their annual Board and Planning Committee meeting on September 22nd at 7:30 PM. If you are interested in helping us plan future events and would like to attend this meeting, please contact me at (781) 665-8172. There have been no bids received so far on the birch collage below. The opening bid is still set at $150.00. You can view the collage at Miter Biter Frame Co in Melrose. Inge Burggraf, a long time Melrose resident and amateur birder, artist, and conservationist, has donated to the Association a 24” x 20” birch bark collage she made entitled “Birch Lodge”, using pieces of birch bark she found while hiking and exploring Mount Hood. The subject she chose for her collage is one of the most iconic scenes at Mount Hood, the beautiful, scenic, and rustic Mount Hood clubhouse with a view of 1st Pond. Since Inge has requested that her artwork be used as a fundraiser for the Association, we have decided to auction it off. It is currently on display at Miter Biter Frame Company, downtown Melrose, at 479 Main Street. The Association will start the bidding at $150.00 and anyone interested in submitting a bid for this unique, one-of-kind artwork, please send your bid to Mt. Hood Park Association, 93 Altamont Ave, Melrose, MA02176 or send me an email at mdittmer@ mthoodpa.com. The artwork has been sealed and is beautifully framed. You can also view this artwork at our website at www.mthoodpa.com . The bid should include your name, address, telephone contact, and your bid. At the end of each day, I will add the current bid amount, with the bidder remaining anonymous, on the Association website at www.mthoodpa.com. The bidding will end on July 31st. Please don’t miss this opportunity to purchase a unique piece of artwork and Melrose history. The city has just officially released their approved 5 year Open Space & Recreations Plan. This Plan can be dowmloaded by clicking on this text. The Mt. Hood Park Association is sponsoring its 30th Annual July 4th Concert in front of the clubhouse at Mount Hood Memorial Park, 100 Slayton Road, Melrose. Festivities will begin Saturday, July 4th, at 6:45 pm with the Middlesex Concert Band providing music. This year’s music program promises to be an exciting selection of new songs highlighting the patriotic theme of the day as well as popular show tunes. Popcorn and lemonade will be provided compliments of Golf Management Co and Melrose Park Department. Metropolitan Area Planning Council (MAPC). This is the beginning of tick season so if you go hiking at Mount Hood or other green spaces, please exercise caution, The link below will take you to more information about ticks and preventative measures to take when hiking. See pictures from Senior Day at the Park Event held on May 12, 2015 - go to Park Events Menu above. As an Association dedicated to the promotion, protection, and preservation of Mount Hood, we are always interested in receiving feedback from users of the park and golf course. If you have any suggestions for improving your experience at Mount Hood or wish to make recommendations how to improve the park, golf course, or improve its recreational use, please feel free to send me your comments at the email address noted in the menu selection entitled, “Contact”. Your comments will be compiled with others and brought to the attention of both the Park Commission and Park Department. Join us for Senior Day at the Park! To attend this event you must reserve a seat by calling 781-665-8172. If transportation is required, please call 781-662-6886 on weekdays between noon and 4:00 p.m to reseve a ride. Reservations must be received befoe May 8th! This event is sponsored by the Mt. Hood Park Association, Council on Aging, Melrose Park Dept., Melrose Recreation Dept. and Golf Management Company. I have read this draft 2015-2020 Open Space & Recreation Pan for Melrose and wish to provide you with my written comments below. Overall this is a wonderfully written and thoroughly researched Plan which I encourage all residents of Melrose to read since it contains a vast amount of information and history on open space and recreational areas within Melrose. It is clear from the population demographics in Table #2 that by 2020, there will be an equal number of our population 0-19 years of age compared to those who are greater than 65 years of age. And by 2030, those over 65 will exceed those from 0-19 by a considerable margin (19% versus 24%). Because of this shift in the age of our population, the city is now going to explore and emphasize, in the years ahead, more open space and recreational opportunities for this older population. Being a senior myself, I applaud this emphasis by our city officials and this comes none too soon. Although I have visited many parks and open spaces in Melrose over the 39 years I have lived in Melrose, Mount Hood remains my favorite recreational space. I have hiked its trails and snow-shoed the golf course during the winter months. As president of the Mt. Hood Park Association, I have attended many Park Commission meetings over the years and petitioned the Park Department to develop plans to encourage our seniors to use the existing open space at Mount Hood as well as to expand and develop additional recreational opportunities for them at the park. Although I have had limited success in this effort, the Park Department has installed one vandal-proof picnic table as well as several benches over the past five years. But based on the information and data in your draft 2015 Plan, more should be done at Mount Hood since it represents the largest open and green space in the city. In your draft Plan there appears little emphasis being put into developing additional senior recreational opportunities at Mount Hood other than developing existing walking trails, improving publicity of trail availability, and establishing a volunteer corps. These are fine goals and represent a renewed interest there, but they lack a bold, forward-thinking and focused approach to expanding recreational opportunities at Mount Hood for our seniors. Back in 2013, the Mt. Hood Park Association conducted a written survey of seniors asking them what additional recreational opportunities they wanted to see expanded or developed at Mount Hood. I surveyed those seniors attending gatherings at the Milano Senior Center as well as reaching out to the seniors located in senior housing located in Melrose (see attached summary of this survey). These data were reviewed and tabulated and as a result, this year will be our third year sponsoring at no charge a “Senior Day at the Park” up at the clubhouse at Mount Hood. Last year we had 100 seniors join us for lunch and lectures on the park and its environment as well as a tour of Slayton Tower and sightseeing. Our initiative demonstrates that seniors will take advantage of these recreational opportunities if given the opportunity to participate. It is clear from this outreach program that seniors are interested in learning more about their surrounding environment and to participate in recreational opportunities. · installing additional vandal-proof benches along the roadway to Slayton Tower as rest areas. · installing more vandal-proof picnic tables at locations near and around Slayton Tower. · paint lines designating a walking path on the roadway leading to Slayton Tower to better define walking space which is shared with drivers and improve safety. · allow seniors access to electric golf carts for transportation to encourage the physically challenged seniors to use the park and to take advantage of Slayton Tower sightseeing and picnic area. · Install horseshoe and bocce courts at the Slayton Tower area and elsewhere where appropriate. · sponsor senior events at the clubhouse such as lectures on hiking, information on recreational uses of the park, biodiversity in the park, conservation activities both at the park and elsewhere in the city, etc. Association President Myron Dittmer has been invited to speak at the Milano Senior Center Cultural Corner monthly program on March 13th, at 1:30 PM. His topic will be "Historical Development of Mount Hood Memorial Park & Golf Course". Mr. Dittmer will discuss the current features of Mount Hood, its recreational opportunities, the city plans for its future, the building of the park by the WPA with historical photos, and memorable happenings at the park over the years. This promises to be a stimulating and informative discussion on the largest green space in Melrose. To join us for this event, contact the Milano Senoir Center at (781) 662-6886. On Saturday, September 6th, a bronze plaque recently installed at Mount Hood Memorial Park, was formally dedicated by city and state officials at a ceremony honoring the contributions of Ralph Sarni, founder and president of Mt. Hood Park Association. Current Association president , Myron Dittmer, welcomed those in attendance including many Sarni family members, close friends, Mayor Dolan, State Representative Paul Brodeur, president of the Board of Alderman, Don Conn, Ward 6 Alderman Peter Mortimer, Alderman Monica Medeiros, Park Commission Chairman Bill Gardiner, and Superintendent of Parks and Open Spaces, Joan, Bell. “Ralph was a patriot having served as a Marine officer during World War II in the Pacific theater. He settled here with his wife, Lorna, had their family here, and lived here for about 60 years. He was also a philanthropist donating his time and money to his church and favorite charities, participating in fundraising for them, and providing leadership to many non-profit organizations. Giving back to his community was the hallmark of his character and his philosophy of life. It is well known that over the past 40 years, Ralph has played a pivotal part in saving Mount Hood Memorial Park and Golf Course from destruction and development. The first instance occurred in the early 1970’s when the city planned to build the new high school at Mount Hood. As a community activist he rallied successfully to defeat the building of the high school at Mount Hood and this activity lead directly to the founding of the Mt. Hood Park Association, an organization under his leadership, dedicated to the protection, preservation and promotion of the park and golf course. Besides the above plaque, the outside terrace at the clubhouse was dedicated, “The Sarni Terrace”. After the dedication ceremonies, all family and guests joined together for a reception and luncheon in the clubhouse. As part of the Home for the Holidays Celebration in Melrose, the Mt. Hood Park Association invites the public to attend their annual and festive “Children’s Holiday Party” at the Mount Hood Clubhouse, 100 Slayton Road, Melrose on Sunday, December 7th from 1:00 - 3:00pm. Please join us for this popular and festive event which includes live musical entertainment, a visit by Santa Claus, and children sing-alongs! Refreshments will be served. This year we have invited back the Balloon Magic of Yarrow, who will entertain children with his amazing balloon magic twisting them into various shapes and given to children in attendance. All children must be accompanied by a parent or guardian. For more information, contact Myron Dittmer at (781) 665-8172. Next meeting is scheduled for Monday, December 8, 2014, at 7:00 pm at the Mount Hood Clubhouse. Re-Scheduled July 4th Concert on July 5th at Mount Hood Park A great Success! Under bright sunny skies and in one of most beautiful venues in Melrose, Mount Hood, the Mt. Hood Park Association held its 29th Annual July 4th concert on Saturday, July 5th due to hurricane Arthur. This rescheduled concert drew one of our largest crowds which were treated to lively music with a patriotic theme as well as many show tunes. The Middlesex Concert Band of Wakefield, under the direction of Mark E. Olsen, provided spirited arrangements of many patriotic and show tunes to the enthusiastic approval of the audience. Ms. Carissa Scudieri, from Wakefield, and a regional winner of many talent contests, opened the concert with her wonderful rendition of the National Anthem and later sung one of the show tunes to a thunderous applause of those in attendance. The festivities began with introductory remarks by Association president, Myron F. Dittmer, Jr. and Alderwoman Monica Medieros, who extended the good wishes of the city all in attendance for a safe and happy July 4th celebration. Afterwards, Mr. Dittmer paid tribute to Ralph Sarni, the founder of the organization, who passed away last August. Ralph was a patriot, who served as a Marine officer in the Pacific during World War II, a philanthropist, and a community activist, who twice over the past several decades saved Mount Hood Park and Golf Course from development and destruction so that future generations of Melrosians will be able to enjoy this “Green Jewel”. He noted that the city has erected a bronze plaque on a stone at the entrance to the park and have named the outdoor patio at the clubhouse, the Sarni Patio in acknowledgement of his many contributions to the Park and city. This program was supported in part by a grant from the Melrose Arts Council. Also, the Association would like to extend our special appreciation to the following companies and organizations that helped make this event such a success this year. They include, Melrose Park Commission, Melrose Park Department, Golf Management Company, LLC (who provided free popcorn and juice for the children), Hillside Printing, LLC, Inc. (who provided the programs), and of course, the Middlesex Concert Band for their extraordinary music presentation. This year’s event was attended by over 90 seniors who were treated to several lectures, luncheon, and ended with a sightseeing trip to Slayton Tower for a panoramic view of the surrounding countryside and the Boston skyline. An informative and spirited lecture on the biodiversity of the Middlesex Fells Reservation was provided by Dr. Bryan Hamlin, President of the New England Botanical Club and Chairman of the Friends of the Middlesex Fells Reservation. Dr. Bryan presented his personal slides on the many species of plants and animals found in the Fells. Later Myron Dittmer, president of the Mt. Hood Park Association, spoke on the history and development of the park and golf course beginning in the 1930’s as well as winter and summer activities held at the park over the years. The Association would like to extend special thanks to the following organizations for their help in organizing the event, Melrose Park and Recreation Departments, Melrose Park Commission, Golf Management Company, LLC, and the Council on Aging. On Sunday, December 10th, the Mt. 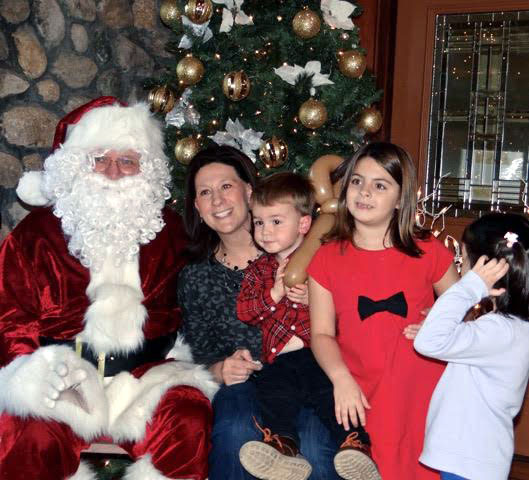 Hood Park Association held its annual free Children’s Holiday Party at the Mount Hood clubhouse in the rustic setting of Mount Hood Memorial Park and Golf Course. 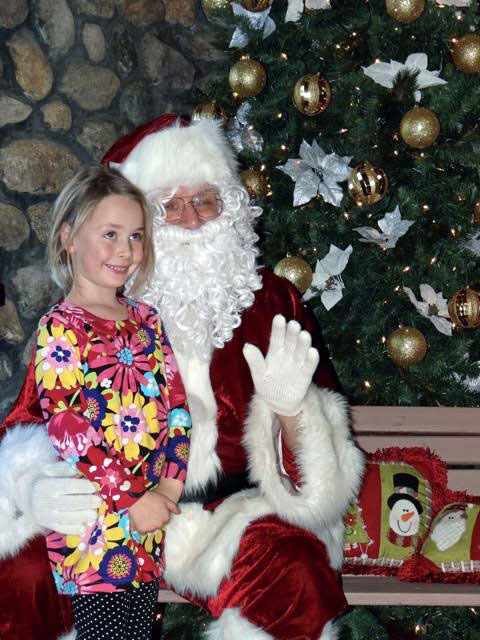 In the festively decorated clubhouse, a large turnout of adults and children enjoyed live musical entertainment, sing-alongs, and the balloon magic of Yarrow, as well as a visit from Santa Claus. Refreshments were provided by the Association while donuts and bagels were donated by Lisa Kennedy of Honey Dew Donuts, Main Street, Melrose. Special thanks are also extended to Golf Management Co, LLC for the use of the hall and decorations and their Food and Beverage Manager, Laura Farrell. Making Mount Hood Park More Accessible to the Elderly & Handicapped. The Association received several suggestions from Melrose residents recently asking if Mount Hood Park could be more handicapped accessible and that special events be held for those who may be physically challenged as well as for the elderly. This segent of the population seems to have difficulty in using and enjoying one of the largest green areas in Melrose. The Association presented a proposal before the Park Commission at their July monthly meeting suggesting ways that they could make the Park more accessible to the eldely and physically handicapped. Some of these suggestions included: (1) adding additional vandal-proof benches along the roadway up to Slayton Tower so that the elderly and handicapped people may be able to rest while walking up to the tower. Also, add some tables near the tower to allow people to rest before proceeding up to the observation area of the tower or before walking back to the clubhouse and parking area, (2) provide free golf cart transportation up to Slayton Tower for those with severe handicaps & the very elderly, (3) develop a wheel chair trail using existing roadways such as around the 2nd and 3rd ponds for viewing those areas, and (4) purchasing special golf carts which can carry more than two people for tours around the paved paths of the park. I have just added some historic golf photos taken at Mt. Hood Golf Course from the 1930's which I received from Bruce Morrison and Tom Hancock. Tom is the son of Mount Hood's first golf pro, Roland Hancock, who was the golf pro from 1936 to 1973. Check out these historic photos today. This event was held on Thursday, July 4th, from 6:45PM to sunset, at Mount Hood Park in front of the Clubhouse at 100 Slayton Road, Melrose, MA 02176.
played by the Middlesex Concert Band of Wakefield and the singing of Wakefield's Carissa Scudieri. Also, during the playing of "Stars & Stripes" we handed out American flags for our favorite part of the evening......the "Parade of Children" who enjoyed marching around the venue while waving flags!